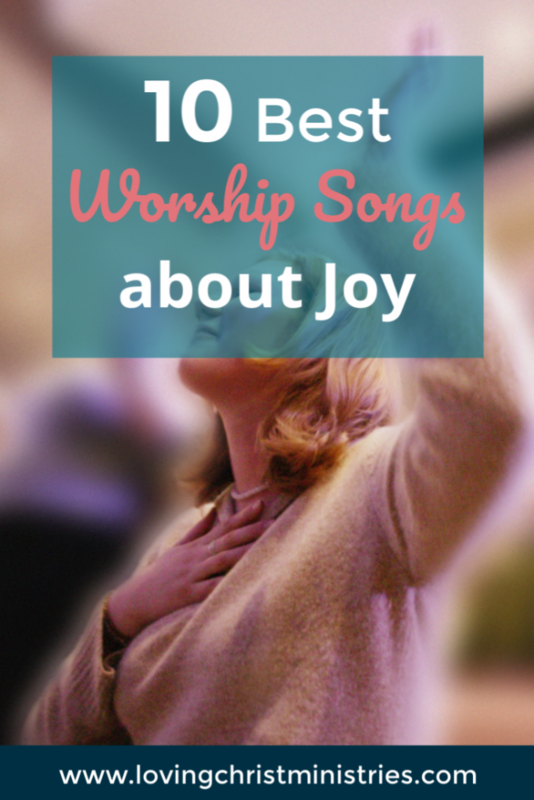 I want to share with you my favorite worship songs about joy. These songs all go along with the Joy in Jesus retreat theme that I recently shared here on the blog. You can also check out 16 Scriptures about Joy to find supplemental verses to use at your retreat. For every retreat, music sets the mood; the songs you pick for your retreat will determine the feeling of the day. When it’s time for quiet worship, slower, more traditional hymns work well. And when you’re ready to motivate the ladies to get up and move, fast-paced worship music is the way to go. Before our retreats, I meet with the music leader to look through song books and choose the ones that fit best with the upcoming theme. Sometimes, when I don’t know the exact song I just explain to her how the mood of the message will be, and she knows just what to pick. This one just makes me extra happy! It was one of my kids’ favorites when they were little. It’s still fun to sing! -Have a music leader who plays an instrument and sings, leading the ladies throughout. Whether you use these songs or others, please take special care when choosing your music. Worship songs about joy will fit perfectly with the Joy in Jesus themed retreat if you choose to lead that or they’ll work with just about any other theme. I’m so thankful for the music that brings life to our retreats. Without it, I just don’t think the experience would be the same. Great post and a great list of songs. LOL Michele! I’m the same way…I LOVE the song. It just makes me happy, but then it’s in my head all day long! You’re right, though. There could be worse songs! Thank you so much for commenting! Thank you, Kelly! I’m so happy to be a part of #BVNetwork! So much solid Christian encouragement. I’m so thankful! You have a very nice Web site here, and doing a very good work of helping women with retreats. That is such a needed area. If that is ever in my future, I know where to come. I love your worship song collection. The WOW songs I love, and I wish we still sung SHOUT to the Lord in our church. God bless you mightily! Your #BVCNetwork neighbor.